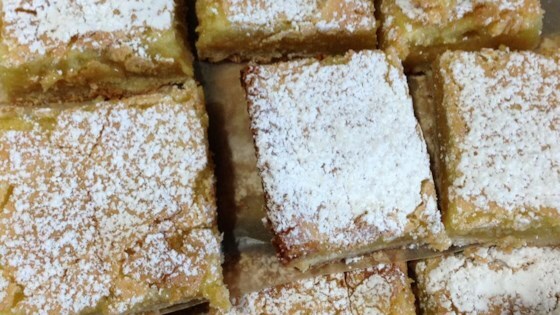 "A traditional but tangy lemon bar. These were truly raved about by my full gluten-eating relatives." Whisk 1 1/4 cup rice flour, confectioners' sugar, and oat flour together in a bowl. Mix butter into flour mixture until evenly combined; press into the bottom of the prepared baking dish. Bake in the preheated oven until crust is golden brown, about 15 minutes. Beat eggs together in a bowl until light and smooth. Combine white sugar, 1/4 cup rice flour, and baking powder together in a separate bowl; stir into beaten eggs until just combined. Stir lemon juice and lemon zest into egg mixture; pour over crust. Bake in the preheated oven until filling is set, about 30 minutes. Cool completely before cutting into bars. Be sure to use confectioners' sugar for the base. I have used different types of flour (such as brown rice flour) with quite varying results. I'm sure there are others that would work but this one worked great so I stuck with it. It also gives the benefits of oats which aren't too available in gluten-free. If you prefer to substitute regular flour just use equal amounts. And don't undercook by following times rather than descriptions! This is the best recipe. My husband loved loved them. I needed a gluten free dessert for a party and tried this. Mixed reviews. I didn't care for the gritty rice flour. Other really liked it! I would prefer more lemon flavor too. Not bad.